For those of you with excellent memories, I started a series a while back about Sugo Sunday. I have to admit, I meant to post this series closer together, but being totally honest, our Sunday dinners are much less structured in the summer time and we’re only getting back into a traditional dinner now that it’s getting colder (insert tears here, not for the food, but for the cold temps). In my first Sugo Sunday post I gave you guys a really quick and easy tomato sauce, the heart of Sunday dinner. 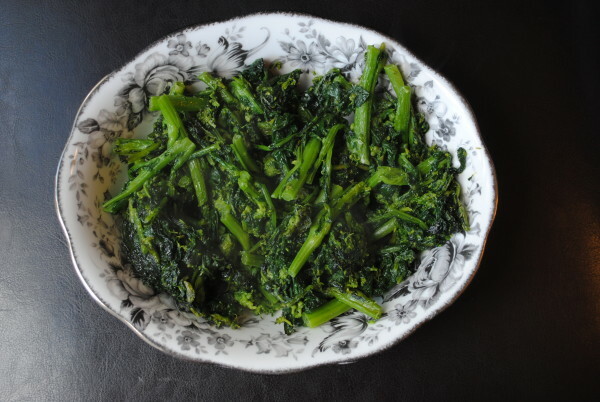 Although sauce might be at the heart of it, it’s rapini that’s my favourite part (or as Rosie calls it – – – PINI!). Quick side note, a couple of weeks ago we were prepping dinner and Rosie asked if we were having rapini, when I told her no there was so much disappointment in her 2-year old sigh that it almost made me go out and get some just for her! Back on point, if you don’t know what rapini is, it comes from the same vegetable family as broccoli, but is more leafy and bitter. Don’t let that scare you, when prepared it is delicious and full of flavour! It is easily one of the most favourite side dishes in our house and I hope it becomes one in yours as well! 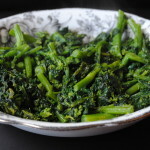 A garlicky delicious sauteed vegetable side dish. Chop about 1 inch off from the ends and add to boiling water. 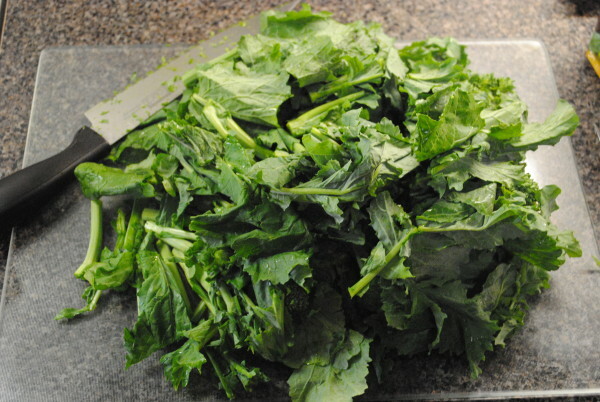 Boil rapini for approximately 5-6 minutes. 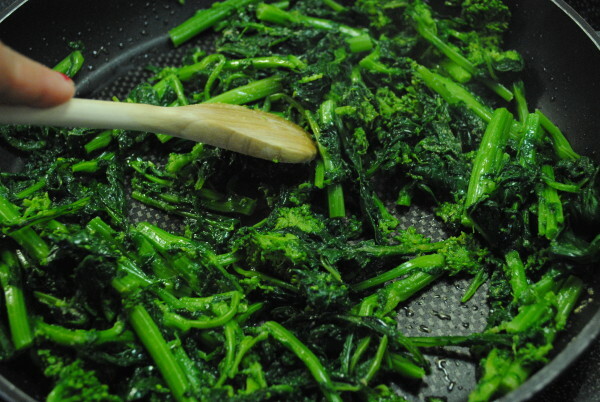 Strain rapini and salt generously. 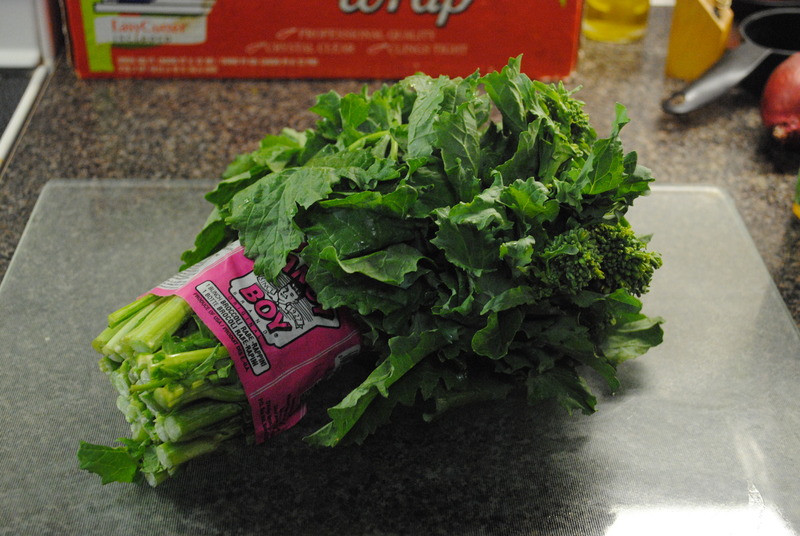 Remove as much water from the rapini as possible - you can use a spoon or fork to press the water out. 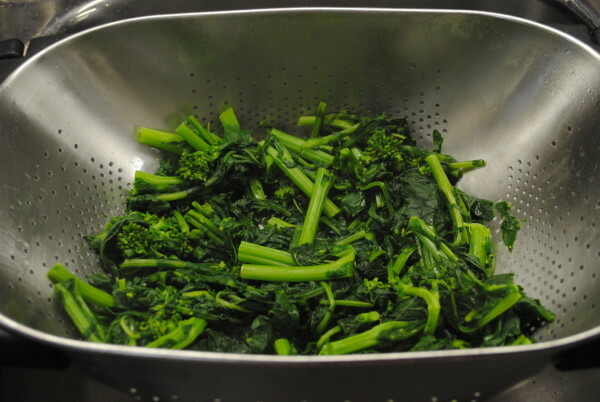 Heat a sautee pan over medium heat with olive oil and add rapini.